Could Custer have been saved at Little Bighorn? HomeDailyMilitary HistoryCould Custer have been saved at Little Bighorn? A number of people thought so but not the two men who could have tried. We can never know what frantic thoughts raced through George Armstrong Custer’s mind in the last hour of his life. But surely, as ever-growing numbers of angry, well-armed Plains Indians closed in on his 210 troopers of the 7th Cavalry, he must have realized that he had fatally misjudged the size of the hostile force now surrounding him. His plan to subdue a large Indian village had completely broken down. He had been warned repeatedly by his scouts that his target, an Indian encampment on Montana’s Little Bighorn River, was far larger than he had imagined. Now, on this very hot June day in 1876, he must have known that he was going to die. Even to the very end of what is now known as Custer’s Last Stand, we can picture the desperate, dust-covered Custer looking hopefully to the southeast for expected help from the rest of his command. He died not knowing why Major Marcus Reno and Captain Frederick Benteen never came up in support. But we know. It is not a story of great valor, although certain moments of extraordinary bravery shine through. Benteen and Reno spent the rest of their lives defending their leadership and action—or lack of action—that day. An examination of the known facts reveals that they had a lot to defend. The growing presence and power of the white man, backed by overwhelming military strength, had gradually forced many of the Plains tribes onto reservations. However, some militant Indians still defied the United States government and chose to continue their nomadic lifestyle in the Unceded Territory. That huge expanse stretched from the Bighorn and Rocky Mountains on the west to the Great Sioux Reservation along the Missouri River to the east. It was there that the final battles of the Indian wars were fought. On November 3, 1875, President Ulysses S. Grant and a few carefully selected cabinet members and Army generals met in secret session. The decision was made to launch a decisive war against the Indians and cripple their ability to further disrupt western expansion. Although no one knew it at the time, Custer’s fate had been sealed. On December 6, the government issued an ultimatum. All roaming Indians would have to return to the reservations by January 31, 1876, or risk being considered “hostile.” In early February, Lt. Gen. Philip Sheridan, commanding the Division of Missouri, ordered his forces to prepare for operations against the hostiles. The military plan was a three-pronged affair. One force under Brig. 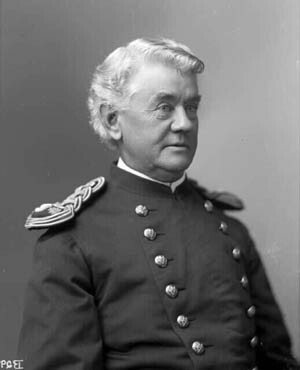 Gen. George Crook moved out from Fort Fetterman in Wyoming. 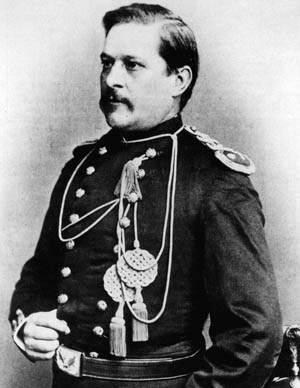 Colonel John Gibbon marched from Fort Ellis in Montana. The third unit, led by Brig. Gen. Alfred Terry, advanced from the Dakota Territory. Terry released Custer and his 7th Cavalry as a mobile strike force to track and locate the Sioux and Cheyenne tribesmen thought to be in Montana Territory in the Little Bighorn Valley. By late June, however, the plan to link up and trap the hostiles was falling apart. Crook was defeated by an Indian force on the Rosebud River. Terry and Gibbon got temporarily lost. Custer was essentially on his own. In fact, Terry had given Custer unusual freedom. One part of his orders read, “We place too much confidence in your zeal, energy and ability to impose precise orders upon you which might hamper your action when nearly in contact with the enemy.” That was all the ambitious, headstrong Custer needed to hear. It triggered the inevitable chain of events that led to his death. Counting 35 Indian scouts and civilians, Custer led 12 companies, 680 men, seemingly a substantial strike force. But by the time he headed out from Fort Abraham Lincoln on June 22, the number of Indians camped along the Little Bighorn had swelled to 7,000. Between 1,000 and 1,500 of these were warriors. Custer’s scouts found numerous trails leading to the Little Bighorn, and soon discovered the massive encampment that now held seven different Indian bands in a straight line stretching almost three miles. Even then, Custer did not seem to understand how many armed warriors he was facing. Not only did Custer reject the warnings, he divided his force into four groups. He ordered Benteen to take three companies of 120 men, scout a series of ridges to the southeast to spot any Indians trying to flee, and then rejoin him. Private Charles Windolph later reported that he heard Benteen protest, “Hadn’t we better keep the regiment together General? If this is as big a camp as they say, we’ll need every man we have.” Custer curtly replied, “You have your orders.” Custer then ordered Reno to take three companies of 140 troopers and 35 scouts and launch an attack from the south end of the village. The slow pack train, under Captain Thomas McDougall, was given another 175 men. Custer retained five companies with 210 mounted soldiers and civilians. He promised to support Reno in the attack. To say the least, the plan was impulsive and uncoordinated. The uncoordinated rush back to the river was total chaos. The soldiers drove their horses into the water, crossed the river, and clawed their way up the steep 100-foot bluffs on the other side. The Indians, riding on their flanks, poured a withering fire into the wildly retreating soldiers. Some 80 troopers, including 13 wounded, managed to get to the top. Seventeen others were left in the woods. Thirty of Reno’s men were killed initially, and another 27 died in the fighting. Reno insisted later that his retreat was actually a charge. Historian Walter Camp, who interviewed many of the participants soon after the battle, cited Benteen’s reply upon receiving the message: “After he read the message handed to him by Martin, he was heard to remark, ‘Well, if he wants me to hurry how does he expect that I can bring the packs? If I’m going to be of service to him I think I had better not wait for the packs.’” As Benteen rode closer, he suddenly saw Reno’s men scrambling to the top of the hill as Indian warriors swarmed in front. It was now 4:10 pm. A few minutes later, Benteen’s force joined Reno’s position. Martin, who stayed with Benteen, told historian Colonel W.A. Graham that he heard Reno exclaim, “For God’s sake, Benteen, halt your command and help me. I’ve lost half my men!” Benteen immediately distributed his extra ammunition to Reno’s men. Could Benteen Have Aided Custer? It has long been maintained that the Reno-Benteen forces were trapped on the hilltop by hundreds of Indians. In fact, Benteen told the court of inquiry, “The 900 Indians I saw in the valley remained there perhaps a half an hour then most of them went down the river.” In truth, the Indians were gone within minutes of Benteen’s arrival. Letters, memoirs, and subsequent interviews with both Indians and army troopers refute his sworn testimony. Lieutenant Charles DeRudio, one of those who remained hiding below in the valley, said, “Soon after Major Reno left the timber, firing commenced at the other end of the village. I heard immense volleys and more than half the Indians left.” In a 1916 interview, Crow scout Hairy Moccasin said he saw Reno’s fight in the valley, which he described as “a big scramble with lots of Sioux.” Later, Custer asked him, “How is it going?” He replied, “Reno’s men are fighting hard.” Boyer then sent him back south, where he met Benteen on the hilltop. Hairy Moccasin said to him, “Do you hear that shooting back where we came from? They’re fighting Custer there now.” This was specific information on Custer’s location that Benteen later denied knowing. At 5:05 pm, Captain Thomas Weir, who had been seen arguing strongly with Reno and pointing excitedly downstream, took his company, on his own, in that direction. From what is now known as Weir’s Point, he saw the end of the Custer battle, then returned to the top of the hill. He reported that he had seen Indians firing at troopers’ bodies already inert on the ground. Perhaps the most revealing testimony came from Benteen himself. He told the Chicago court, “A movement could have been made down the river in the direction Custer had gone upon my arrival on the hill, but we would have all been there yet.” Apparently, Benteen didn’t like the odds and figured that any soldiers who went that way also would have been killed. His sworn testimony that he and Reno heard no shooting, that they were tied down by 900 Indians, and that they didn’t really know where Custer was is not convincing. Through the years, both Reno and Benteen tried to improve their version of what happened. They wrote letters and gave interviews in which they maintained that shortly after linking up on the hilltop, the ammunition pack train arrived and a movement was made in Custer’s direction. However, John Gray, in his 1991 book, Custer’s Last Campaign, convincingly shows that it was at least an hour before any such movement was launched, and that was only after continued prodding by Weir and others. Even then, it was a half-hearted advance. Benteen and Reno took only three companies down toward Custer’s position. By then, the window of opportunity had closed. Custer’s 220 men had been annihilated in a little less than an hour, and the victorious Sioux and Cheyenne were now coming back upstream. Quickly, the companies were forced to retreat to their position on the hilltop with the rest of the survivors. Over the next several hours the Indians made repeated charges against the soldiers’ line. By all accounts, Benteen rallied the men, took control of the defense, and was responsible for preventing a rout. In later years, even his critics—and there were many—admitted that Benteen had held the force together. By evening, the shooting diminished and the companies remained through the night, listening to the shouts and loud victory whoops coming from the Indian encampment below. After a nervous night on the bluff, the troopers strengthened their position for an expected attack in the morning. Although the Indians resumed sniping and harassing, they made no serious attempt to drive the soldiers off the hill. 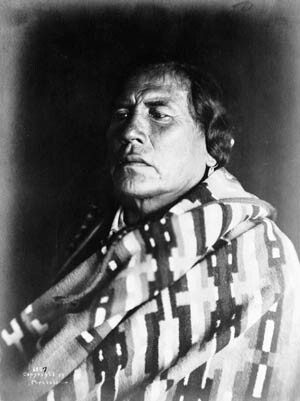 Writer David Humphreys Miller, who in the 1930s interviewed aged Indian participants, said that Sitting Bull told him that he believed the issue was settled, that the white soldiers had taken a drubbing, and he was willing to let it go at that. Numerous Native American accounts contend that it was only after a direct order from Sitting Bull that they were not allowed to attack and overwhelm the Reno-Benteen force as they had done earlier with Custer. Crow Indian “Curly” managed to escape from Little Bighorn. To the relief of the surviving troopers, in the late afternoon of the 26th the huge Indian camp began to pack up and move out. They had been warned by their scouts of the approach of Terry’s force. Fewer than 100 of their warriors had been killed in the fighting on the bluff and in action against Custer’s force to the north. The next day Terry’s column arrived. Fighting at the Little Bighorn was over. Terry found the bodies of Custer and his men scattered above the river in various separate places where different companies had tried to make a stand. The dead bodies had been stripped and mutilated. Custer’s body was one of the few that had not been scalped. Grisly newspaper accounts of the battle and its aftermath outraged Americans across the country. They demanded retribution. From that time on, the Indians’ freedom to migrate, hunt buffalo, and celebrate their spirited lifestyle was running out. The military stepped up efforts to bring any still-roaming Indians under control. Western migration increased, new train tracks were laid, fortune seekers poured in for gold, and the traditional world of the Plains Indians soon disappeared. Custer’s Last Stand was also theirs. The question remains: Could at least part of Custer’s five companies have been saved? Whether Reno and Benteen might have pulled it off can never be known. That they didn’t even try, and then grossly misrepresented the reasons why they didn’t, is no longer open to dispute. Tags Cheyenne Tribe, custer's last stand, Fort Fetterman, General Alfred H. Terry, general george armstrong custer, General George Crook, General Philip Henry Sheridan, Great Sioux War of 1876, John Gibbon, Little Big Horn, Marcus Reno, Sioux, Sitting Bull, Ulysses S. Grant. Reno’s men had been badly whipped and routed. Terrain between Reno/Benteen and Custer full of dips, ravines and rises so ambush and further discombobulation an almost certainty. Benteen saved Reno but couldn’t save both Reno and Custer and did good job saving himself. Rushing pell-mell to sound of Custers remnants would have annihilated every last teooper imho.